Warming in the Arctic may not be beneficial for songbird nestlings as it will also bring wetter and more variable conditions. Songbird nestlings in the Arctic struggle in cold, wet years, but the changes forecast by climate models may lead to even more challenging conditions, according to new research in The Auk: Ornithological Advances. Jonathan Pérez of the University of California, Davis, and his colleagues compared the growth rates of the nestlings of White-crowned Sparrows, which have a broad breeding range, with those of Lapland Longspurs, which are an Arctic breeding specialist. They predicted that nestlings would grow faster in warmer, drier conditions, that clutches laid earlier would do better, and that the nestlings of specialist longspurs would grow faster than the generalist sparrows. They found that growth rates were higher overall in 2013 than in 2014, when the weather was colder and wetter. There were also fewer arthropods, the birds’ food source, available in 2014. Longspur nestlings grew faster than sparrow nestlings both years, but sparrows were unaffected by temperature, perhaps because sparrows nest in shrubs rather than on the open tundra. Nestlings from clutches that were laid earlier did grow faster than those from later clutches, since birds that arrived on their breeding grounds early could claim the best territories for raising young. Challenging conditions force parents to make a choice between taking care of themselves and taking care of their offspring. Climate change is likely to bring new uncertainty for birds nesting in the Arctic—while warmer temperatures will favor higher nestling growth rates, climate models also predict more frequent storms and increased precipitation. 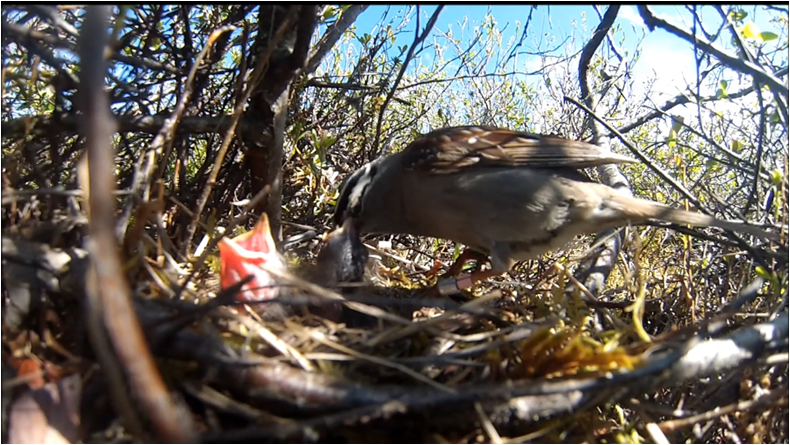 The research was carried out on the North Slope of Alaska’s Brooks Range, where researchers tracked 110 White-crowned Sparrow nestlings and 136 Lapland Longspur nestlings over two years, representing 58 total nests. Perez had previously studied parental energy expenditure and incubation. “When I became involved in our project based out of Toolik Lake looking at effects of interannual variation across trophic levels and how that ultimately plays out in terms of reproductive success of songbirds, expanding to an examination of nestling growth rates with regards to variation in environmental conditions seemed like a logical next step,” he says. Nestling growth rates in relation to food abundance and weather in the Arctic http://www.aoucospubs.org/toc/tauk/133/2.